Unless we’re talking number of steps in your weekly Fitbit challenge with co-workers, using numbers to measure workplace wellness success is on its way to becoming a thing of the past, finds the International Foundation’s latest Workplace Wellness Trends: 2017 Survey Results Report. 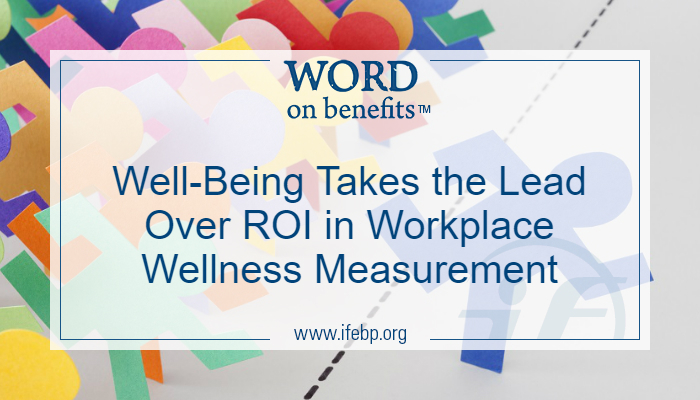 Employers are trading return on investment (ROI) measurement for the prevalence of worker health and well-being. Continued increases in productivity and decreases in absenteeism strengthen the case for workplace wellness programs. The survey found 75% of employers offer wellness initiatives primarily to improve overall worker health and well-being. Only one in four employers said the main reason for offering wellness initiatives is to control/reduce health-related costs. Employers are realizing that wellness is not just about cutting health care costs, because wellness is not only about physical health. Embracing the broad definition of wellness has led to a tremendous impact on organizational health and worker productivity and happiness. Among employers offering and measuring their wellness efforts, more than half have found a decrease in absenteeism, 63% are experiencing financial sustainability and growth in the organization, 66% reported increased productivity and 67% said employees are more satisfied. Employers are using wellness incentives like gift cards, gym reimbursements and contributions to health accounts (HSAs, HRAs or FSAs) to help build interest among workers, and most are considering the incentives to be successful. Employers are also implementing targeted wellness communication campaigns to overcome common barriers, reaching out to different generations/age groups, those with health risks and those managing various life events (parenting, retirement, aging parents, etc.). International Foundation members can access the full survey report at www.ifebp.org/workplacewellness.